Hey Oppo. Its been a while since I’ve been around, but today was the C&C New Canaan season opener and I snapped a few photographs. There were a lot of stunning cars, there were a lot of beautiful pooches, and I got to drive there in a Porsche Turbo S. How could I possibly ask for a better day? I’m not sure why, but I’ve been into architectural silhouettes recently. I’m catching a train home for Thanksgiving recess and I finally get to be reunited with two of my favorite non-human things: my dog and my car. Here’s a picture mom sent me featuring both. There are few things will get you banned from CL, all of which are legitimate. As a member that has been here since day one, is this enough to do me in? Peter, will you really do it? Hey there Oppo. I’m SmoresTM; your local stance conspirator. Welcome to Car Culture 103, a beginner level class that I just made up! Today we will be discussing stance. Last night, I decided to do a little experiment to show you that a lot of your conceptions about stance are probably wrong. I hope this makes everyone sufficiently angry. I, on the other hand, am quite happy with this photo dump. Happy belated Wagon Wednesday. I also realized that I have never really used my Micro Nikkor 60mm lens, so I scooped him up from in-between my window and the screen and had a little photoshoot. Four years ago, Mike Burroughs lost a friend. 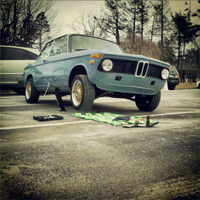 Some of you may know the story, others may not, but his BMW E28 (a.k.a. Rusty Slammington) was engulfed in flames during an unfortunate garage fire. I had followed this car since 2009 or so, and learning of this accidental viking funeral nearly had me in tears. How quickly do you think a BMW 2002 Turbo could make its way around the ‘Ring? If you guessed 7 minutes and 28 seconds, you’d be dead wrong. Well, in real life at least, but this is Digital Burnouts, where you would’ve been right on the money! Built a car when I was drunk. Drove it (virtually) when I was sober again. The results had me laughing so hard I almost cried. Sub 8 minute ‘Ring time in a Land Rover Defender 90? Sure, we can do that. Not too bad for a Nissan Silva. Time to Update Your Gamer Tags! With Forza 6 coming out tomorrow for Ultimate Edition players and the 15th for everyone else, it’s time to make sure your gamer tag on the Oppo Gamer Tags google doc is up to date. I’ve gone ahead and added a Forza 6 column under games owned so you can easily know who will be playing. I don’t typically like red cars. This manual BMW 840, however, I like quite a lot. What Car Would You Hate To See Stanced?